So – anyhoo. 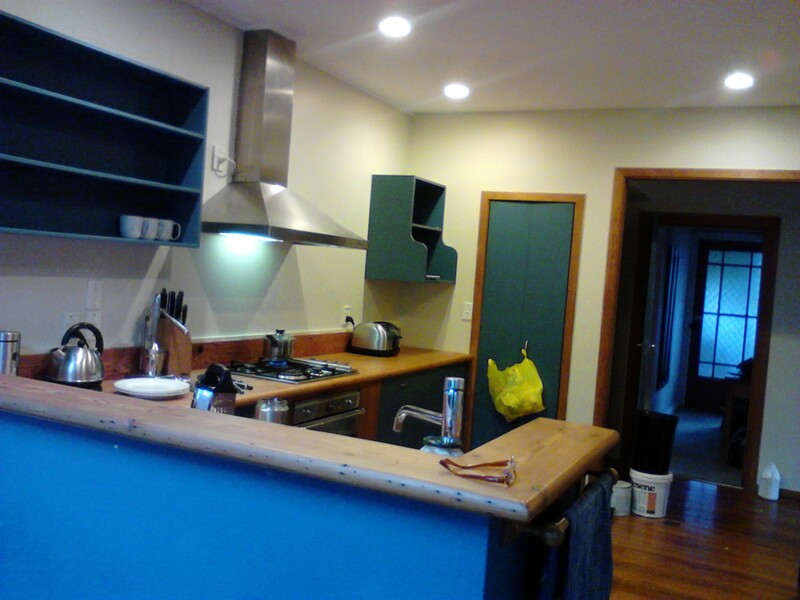 Here is a photo of my freshly painted kitchen for you to all ‘Ooooh and Ahhhh’ over. As you can see – I don’t even have all our crap in the shelves yet!! I imagine it will start looking a little more cluttered once that junk reinstalls itself. Oh – and just to give you a little idea about the colour the walls were before we painted? Check out the plastic bag colour hanging on my pantry door. That precise colour. Oh yes – it was that attractive. It seems that at the moment – if I am not painting our unborn child little canvases for it’s bedroom, I’m painting kitchens. I do have high hopes of possibly painting the hallway over the next week or two – but we’ll just have to wait and see. In the meantime, it’s now November and I should really forget the whole painting buzz, and focus on gettin’ Nano’d instead. My goodness, I know. But the think is – because my kitchen is an ‘internal room’ and the rest of my house surrounds it – I always had to turn the lights on to see anything properly in there. So the yellow actaully felt very dark. Now it feels bright and airy and light. Much better! Hi Ya i just love the new colors so so much better! Yeah, it’s looking really really good. I’m rather impressed with all of our efforts to be honest! You’ll love it when you come back and see it with your own eyes as well. Painted the inside of the pantry white as well. So much much cleaner!